For Christmas I made yogurt from just whipping cream for the very first time. It whipped up much better than I expected. If you haven’t made it, it’s basically just yogurt made from whipping cream in the same way you would normally would make yogurt from milk. Since it’s kind of an indulgence I just made a half batch. Then I used my stand mixer to whip it up with a little honey and vanilla. It was pretty light and fluffy and tasted pretty much like regular whipped cream, with a hint of a yogurt taste (in a good way). After I had used what I wanted during the holidays I had some left over. I didn’t want to just eat it so I decided to try to make it into something that would keep for a little while. So I whipped it up with some banana (always have those on hand), honey, and vanilla and froze it. Slice bananas into a large bowl. Add yogurt, honey, and vanilla. 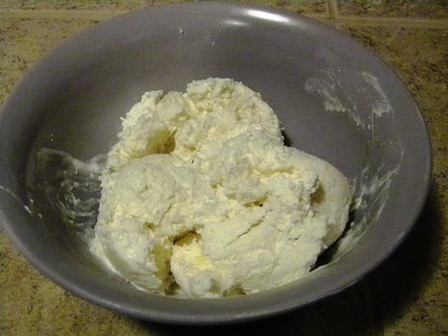 Beat at high speed until yogurt is light and fluffy – it should at least double in volume. Scoop mixture into a freezer container and freeze for a few hours. If desired you can stir it a few times during the freezing process to keep it from freezing as solid. Allow to thaw for a few minutes before serving. Well doesn’t that look positively delicious. 🙂 Amazing what you can do with so few ingredients!!!! looks yummy, I’ll try that tonight ! I gotta laugh because I have been seeing it a lot lately! Can’t figure out why Google thinks I need to lose weight, and there’s no way I’m trying ANY diet without bananas. I made this recipe and added blobs of peanut butter- omg it is so delicious!! My new favorite dessert.